Heat oil in a Dutch oven over medium-high heat then add onion, garlic, red pepper flakes (if using), and bay leaf. Cook while stirring frequently, until onion is translucent, about 3 to 5 minutes. Stir in the crushed tomatoes, brown sugar and bread; bring soup to boil. Reduce heat to medium and cook, stirring occasionally, until bread is completely saturated and starts to break down. Remove and discard bay leaf. 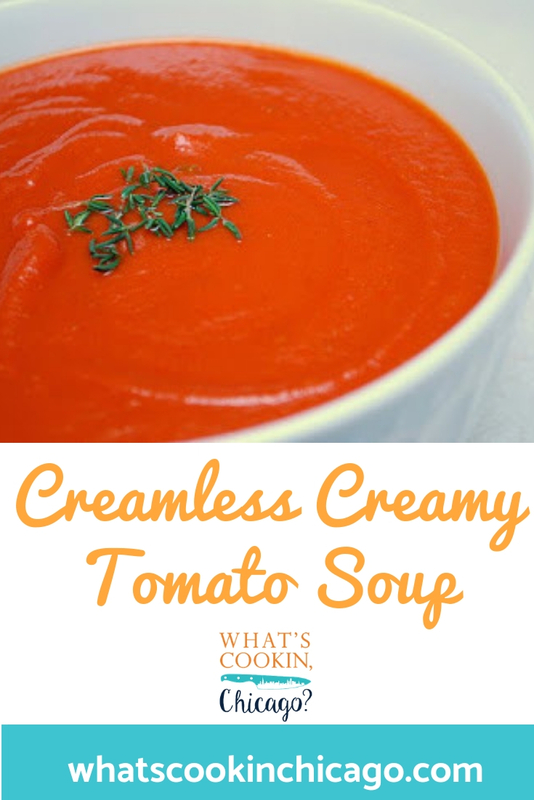 Transfer the soup to blender or use a blender stick in the pot and process until soup is smooth and creamy. Return the soup into the dutch oven (if you transferred it to a blender) and stir in the chicken broth. Bring the soup to boil and season to taste with salt and pepper. Serve soup in individual bowls. Sprinkle each portion with pepper, thyme leaves and drizzle with a garnish of olive oil if desired. Wow - I'm amazed that bread thickens this soup. I can see from the picture just how rich it looks. Yum!! What an interesting way to thicken soup! I often use potatoes when I want to thicken a soup without adding cream, but we always have bread around, so I'll have to try this out! Made this tonight with home canned romas instead of crushed tomatoes. It was fantastic. We let it simmer while we made our version of your grilled cheese (colby jack cheese and no tomato) and the flavor in the soup wasn't nearly as bright and was amazing. Thanks for the recipe and inspiration!